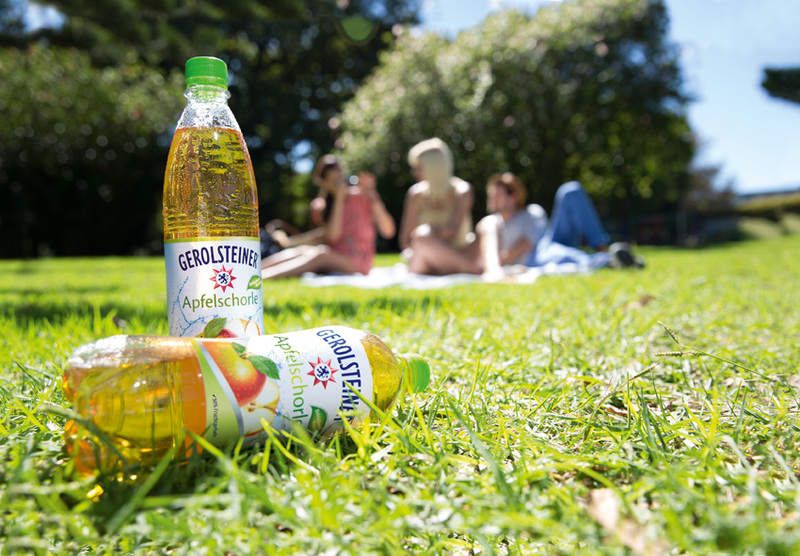 Gerolsteiner Apple Spritzer: Refreshing with just a touch of fruity sweetness. Gerolsteiner Apple Spritzer has 50 percent fruit juice and no added sugars. Apple juice and natural mineral water are the ideal combination – the perfect refreshment. Gerolsteiner Apple Spritzer is available in 0.33 l + 0.75 l glass bottles and in the compact 0.5 l PET bottle. Only Gerolsteiner Mineral Water from the Volcanic Eifel region is used in the production of our Apple Spritzer. 50 percent apple juice from apple juice concentrate, plus lemon juice concentrate. For a natural fruit aroma, natural aromatic components from the fruit may be added. Only natural carbonic acid from the spring is used. Gerolsteiner Apple Spritzer contains 5.3 grams of sugar/100 ml. This is natural fruit sugar from fruit juice. This drink contains no ingredients, which could be problematic for somebody who suffers from allergies. Gluten, the protein gluten typical of many types of grains, triggers health problems for people with gluten intolerances or coeliac disease. This drink is gluten-free. What amount of carbonic acid does Gerolsteiner Apple Spritzer contain? The carbonic acid content is 5.0 g/l. Why does Gerolsteiner Apple Spritzer have 50 percent fruit content? Many consumers now prefer spritzers in a mixing ratio of 50 percent mineral water to 50 percent fruit juice, because the drink then tastes less sweet. In addition, the calorie content (24 kcal/100 ml) is lower than in a spritzer with a higher fruit juice content. Which fruits are contained and where are they grown? Gerolsteiner Apple Spritzer contains 50 percent apple juice from apple juice concentrate and a small amount of lemon juice. Depending on the temperature and the weather cycle, both the harvests and the quality of the fruits, for example with regard to the acid content, change from year to year. Therefore, the apples for the apple juice concentrate used by us come from different regions, generally European countries, but also from outside of Europe. The fruits for the lemon juice concentrate come from Spain and Argentina, amongst others. Why does Gerolsteiner Apple Spritzer contain lemon juice? In the recipe for our Apple Spritzer, we use a small amount of lemon juice. This addition serves the purpose of rounding off the taste. In this way, sweetness and acidity are brought into a better balance. This addition is declared on the label. How high is the sugar content and which sugars are used? In order to create a well-balanced sweet-acidic ratio, we add natural fruit sugars to Gerolsteiner Apple Spritzer. The sugar content per 100 ml is 5.3 g, this corresponds to 5.5%. Is Gerolsteiner Apple Spritzer suitable for diabetics? Gerolsteiner Apple Spritzer contains natural fruit sugars from the added fruit juice. A bread unit corresponds to 218 ml. Using the bread units, we recommend that diabetics clarify with their family doctor whether the drink may be consumed with their form of diabetes. Firstly, aromas are used because no direct juice/fresh juice is used in the products; rather, fruit juice concentrate is used. When the drinks are blended, the aroma that originally was characteristic for the taste and smell of the fruit juice, is added to the fruit juice concentrate. Another reason for using aromas is the possibility of specifically shaping the flavour profile in this way and orienting it towards consumer requirements. The best-before date varies between nine and eighteen months depending on the bottle. In order to guarantee flawless product quality and to prevent germs, for example from the ambient air or the packaging, from spoiling the drink, the cold sterilisation agent Velcorin (dimethyl dicarbonate, DMDC) is used as a technical additive when Gerolsteiner Apple Spritzer is bottled. Velcorin is added to the drink immediately before it is bottled. It has its sterilising effect immediately and then decomposes within a few hours into tiny quantities of methanol and carbonic acid – both of which are also natural components of fruit drinks.